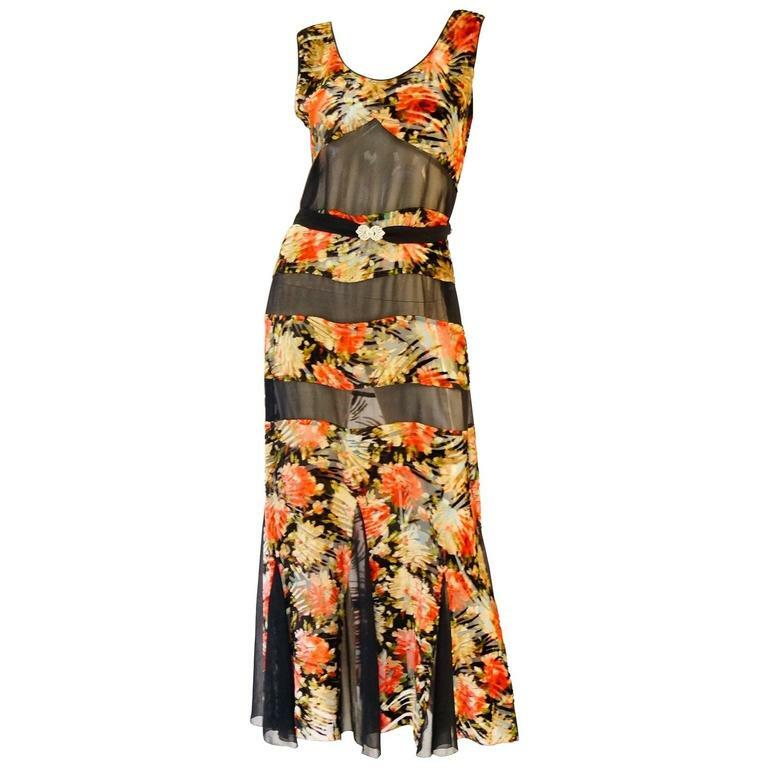 Romantic vintage maxi dress with matching bolero. This ankle length dress features alternating panels of floral rose burn out velvet in fall colors, including red, gold, blue, pink, and green, and black. The sleeveless dress has a godet skirt with pleats, a scoop neck with velvet hem, and a scoop neck back with an "X" crisscross strap design in velvet. The mesh bolero jacket has bell sleeves with velvet pleats and a velvet collar that ties in the back. 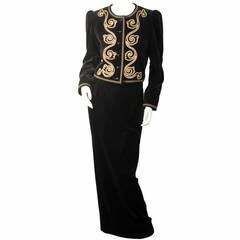 The waist of the fluted dress is accented by a velvet belt with floral rhinestone buckle. This light and airy ensemble is versatile and can be dressed up for the evening or dressed down for the daytime any time of year. This gorgeous piece was purchased from the celebrated Suddon-Cleaver costume collection. Pyechased from the Museum of Fine Arts Houston Costume and Textile Collection Auction. 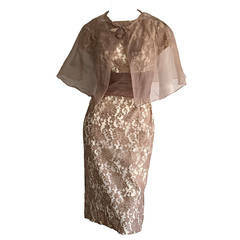 Dress - Bust: 37 1/2, Waist: 32, Hip: 37 1/2, Shoulder Hem Length: 52 1/4 inches Bolero - Shoulder Hem Length: 15 1/4 inches Belt - Length: 32, Width: 1 1/8 inches *All garments and accessories have been professionally cleaned and thoroughly checked before shipping. They are ready to wear upon arrival.